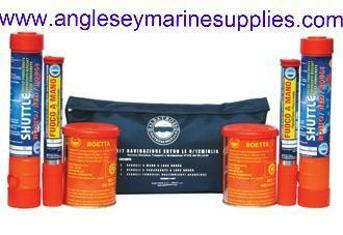 Anglesey Marine Supplies are online suppliers of all marine safety equipment to ensure your well being and safety at sea, we supply inshore, coastal, personal distress and offshore flare kits, hand flares, orange smoke cannister flares, basic and complex marine first aid kits, fireblankets, fire extinguishers, towing mirrors, jump leads. 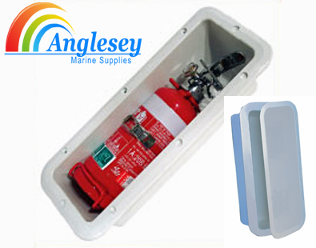 New products recently added, boat fire extinguisher lockers, cabinets...Make Anglesey Marine Supplies Your First Choice. 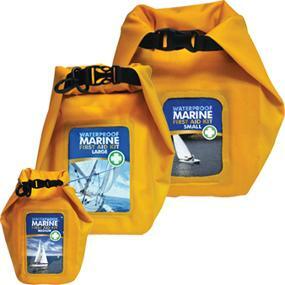 The inshore distress flare pack is designed for use less than 3 miles from land, Supplied in a waterproof window wallet. 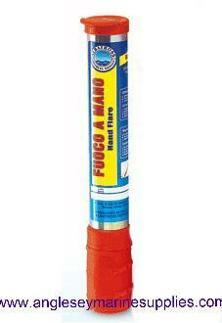 Coastal marine safety boat flare kit, for use up to 7 miles from land. Supplied in a sprayproof carry case. The distress kit comprises of 2 red hand flares, 2 orange hand smokes, and 2 parachute red rockets. Designed for all vessels sailing more than 7 miles from land. Supplied in blue waterproof reinforced dry bag. 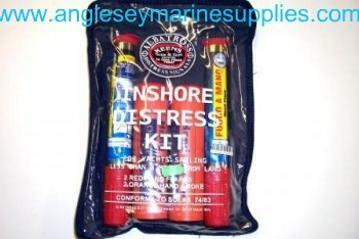 Offshore Distress kit comprises of 4 red handflares, 4 parachute red rockets, 2 lifesmokes. Used for distress signalling purposes on ships, lifeboats, life rafts and for pleasure craft. Burns for 60 seconds at 15,000 candela. Visible up to 5 miles. For distress signalling purposes on boats, yachts, jetskis, hiking and climbers. Tube is made of corrosion-resistant steel with plastic handle extendible. • Pull the loop. The flare ignites after 2 sec. delay. 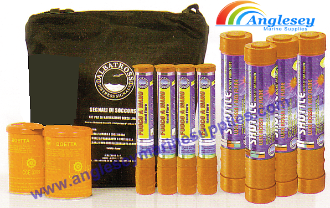 DNS Orange Smoke Signal Distress flare canister for use in Boats, Liferafts and Lifeboats according to SOLAS regulations. Smoke duration time : > 3 minutes. Safe to use in oil or petrol covered water. 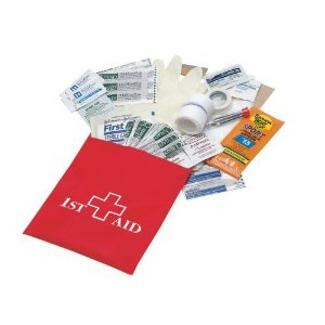 3 Sizes of marine first aid kits available from basic which is ideal for small boats and personal watercraft to our large first aid kit with comprehensive contents ideal for larger vessels. All kits enclosed and contained in a waterproof pouch for protection. Waterproof first aid kit in nylon bag with waterproof zipper. Stows away easily anywhere, Doctor selected items. A must for all vessels. 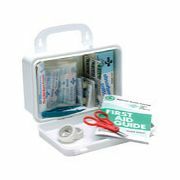 The Seachoice deluxe marine first aid kit comprising of a large selection of doctor selected items. 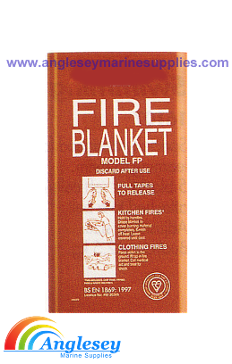 Kitemarked fire blanket in hard pack. 1 x1 metre in red rigid PVC slim container. For use in boats, motorhomes, caravans, workshop or in the home. 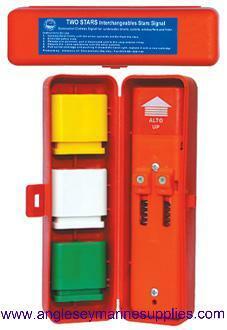 Boat hatch type storage case for fire extinguishers. Flush mounted fitting allows safe and protective storage of a fire extinguisher in the boat cockpit or dashboard. UV resistant construction. White ASA, Takes fire extinguishers to 2kg. Also ideal for caravans, motor homes etc. These Immersion Suits are made from reinforced Neoprene and incorporate a face seal & flap, three fingered glove , front waterproof zipper, ankle cuffs, neoprene pocket and retro reflective tape. 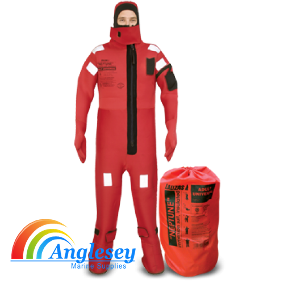 All of these features have been designed to protect the wearer against cold without diminishing freedom of movement and exceed the latest SOLAS specification for hypothermia protection Perfect for all commercial oerations including oil rigs, rescue boats , ocean sailing etc. Low cost effective flotation suit. Use this hand-held air horn as a temporary fire alarm or for attracting attention in emergencies. The hand operated horn requires no refill canisters. Operates on pumping action alone. Each squeeze of the plunger will blow the horn once! Can be repeated as often as desired. 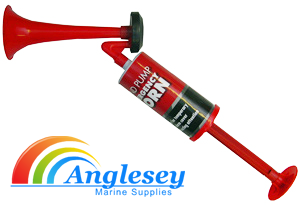 Perfect for marine applications, ideal as a back up horn in case of onboard horn failure.